Banerjee, Debanjali, PhD in Textile/Color Chemistry in Natural dyes, Jadavpur University, Kolkata, with a Masters in Textile and Clothing from S.N.D.T. Women’s University, Mumbai, with NET (Research & Teaching). Currently an Assistant Professor with National Institute of Fashion Technology, Kolkata, earlier with Jadavpur University, Kolkata in Chemical Engineering Department as Assistant Professor. She has been visiting faculty at Apparel Export Promotion Council, Kolkata and J. D. Birla Institute, Kolkata, also worked with Bombay Textile Research Association, Mumbai. Coordinated projects in the field of Science and Technology, Survey and Auditing programs, pattern developments, color matching. She worked on projects funded by UGC, CSIR and DST. With published papers in National and International Journals, she is a member of several prestigious bodies. 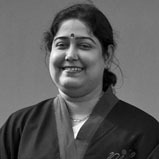 Her research interest includes Indian traditional textiles, blending with modern trends, using traditional natural dyes, research and development, commercialization of research project, Her works include Herbal Gulal from natural colors, Natural Colors from waste flowers, Cosmetics using natural products and other medicinal research. She has conducted workshop for artisan groups and weavers.